Having a home with pets, especially dogs and cats, lends itself to needing constant cleaning. It can be extremely difficult to narrow down your options and choose a vacuum that is good for multiple uses. This is especially true if you need a vacuum that not only can clean all parts of your home, but is strong enough to handle the demands of cleaning constant pet hair. Most articles about pet hair for vacuums simply give you a long list of vacuums to choose from, all of which do ok for pet hair. In this article, we approach things a little differently. We aren't going to give you a huge list of vacuums that are all fairly similar. That's just too much information to digest. Instead, we are going to give you a short list of the best of the best. We will also tell you what to look for when shopping for a vacuum cleaning for a home with pets. With this information, you can make your own decision about which vacuum is the best for your home. In our tests, bagless vacuums performed the best overall. Most modern consumer-grade vacuums on the market are bagless. For pet hair specifically, with bagless vacuums you generally get more accessories included for cleaning upholstery, they are more versatile, and the ones selected have no issues with pet hair tangling. This 3 in 1 vacuum works great on all surfaces and does a great job on pet hair. It comes with a HEPA vacuum is an excellent all around choice. An older model that still holds it own but can often be found on sale. This lightweight affordable vacuum is specifically designed to clean up pet messes. It comes with a variety of attachments that make it great for multiple uses. The Bissell pet hair eraser is the ultimate vacuum for pets. I comes with more attachments to help clean up pet messes than any other model. It's anti-tangle brushes makes maintenance easy. The Bissell CleanView is a bargain. At under $100 is does a decent job and is arguably the best value for the money. It struggles with hard floors but does well with pet hair on carpet and upholstery. The Samsung Powerbot is an intelligent robot vacuum that will clean up your pet messes for you. It tackles pet hair, cat litter and other debris and requires nearly no maintenance. This incredibly powerful vacuum dominates pet hair. Its extra strong suction makes it great for homes with thick carpets, and thick pet hair shedding. It is very straightforward, and you're not paying for extra features you don't need. This powerful Dyson V10 alternative is a great option if you have wood floors and need the versatility that goes along with a cordless vacuum. It has excellent suction, battery life, and doesn't get tangled easily in pet hair. This lightweight, corded ultralight vacuum is great for home with one or multiple pets. It has the power you need to clean up pet hair, but the maneuverability you find in vacuums with smaller motors. It is great for reaching tight areas and upholstery. This affordable upright vacuum is a great choice if you have a low budget, but want a handful of accessories. It comes with pet-specific tools and is great for all types of flooring. When it comes to vacuums for homes with pets, Shark has basically cornered the market. They are known for putting out top quality products that are engineered to suit the needs of people who have a lot of pet hair to deal with. The Shark Rotator NV752 is easily the most popular model by Shark when it comes to cleaning up pet messes for a variety of reasons. First, it is extremely versatile. This vacuum can easily transition from carpet, to wood, to tile, and back to carpet without much effort. It is powerful enough to clean deep down in carpets but has the option to be gentle enough to not scratch your floors. This is a pretty big deal. Most vacuum cleaners don't come with an additional motorized attachment. The brush is an electric tool that snaps onto the end of your hose and allows you to clean upholstery much for effectively. This was one of my personal favorite parts of this vacuum and is something to strongly consider when you are thinking of making a purchase. This is a powerful vacuum, especially for its price range. It is an older model, but it has stood the test of time. This vacuum is also remarkably quiet for how strong the suction is. It is very rare that you find a product as affordable as this one, with so power and versatility. It will easily get pet hair that is deep down in carpet, in tile grout, or up against the edges of your wall. Hoover is one of the oldest vacuum companies still in business, so it goes without saying that they know how to make a quality vacuum. What makes the T-Series WindTunnel Pet Rewind so special is how much they managed to pack into this machine and still manage to keep it under $200. With this vacuum, you get a lot of features that you would expect to only find in higher priced premium models. Features such as the air powered brush attachment, retractable cable, and tangle-free suction system are just a few of the things that make this vacuum stand out. The T-Series WindTunnel does well with both small and large particles on carpeting, but it should be noted that with this vacuum, you cannot turn off the brush rollers so if you have wood, you want to consider another vacuum that can better protect your floor from scratches. This is a very powerful vacuum, and can easily compete with higher priced models. However, this power comes at a price. This is one of the loudest vacuums on this list, with an average noise output of around 80db, which is about as loud as a garbage disposal. If your primary concern for purchasing a vacuum is to help get rid of pet hair, this is an excellent option. The Bissell 1650A Pet Hair Eraser Vacuum comes with more tools that designed specifically for use with pet hair than any other model on this list. This vacuum comes with a motorized brush, a 2-in-1 pet hair hose attachment, a LED-lit crevice tool, and a few other additional accessories. The Bissell 1650A Pet Hair Eraser comes with two filters, one regular one, and one febreeze one. The Febreeze filter is great if you're worried about pet odor. It leaves a fresh scent behind after cleaning. This is the only vacuum on this list with this type of filer. However, replacing this filter costs a little more than replacing an ordinary filter, and it doesn't actually do a better job filtering out dust and dander. So, using this filter is really up to personal preference. While this vacuum excels on the carpet, you can choose to shut off the brushes and raise the head if you want to clean hard surfaces. This will help protect your hardwood floors from scratches. It performs best on carpeting, where it's full power can be put to the test, but you should be able to clean up pet hair on other floor types as well. This vacuum is not the most powerful, and it honestly doesn't do the best job on all surfaces, but the reason it made its way onto our list is that it is an incredibly good value. Usually, it can be found for under $100, and it still does a good job, and will exceed your expectations for a vacuum in this price range. Like we mentioned before, this is not the strongest vacuum you will find. However, it is strong enough for most situations. It had no trouble picking up large and small debris, as well as long and short pet hair from carpeting. It did struggle on hard floor, and made more of a mess than it did cleaning. If you have primarily wood or tile floors, do not get this vacuum or you will be disappointed. If you have carpet, however, this is an excellent option as a price you can't say no to. One really great thing about the Bissell 9595A CleanView Bagless Vacuum with OnePass is that you have the option to buy a bundle, or just buy the vacuum by itself. If you are willing to spend a little extra money, you can opt for a bundle that includes a hand tool, an easy maintenance bundle, and stain remover bundle and a few others. This is pretty unique, and offers the ability to give consumers a wide range of price options if they want this vacuum, but only want certain accessories. If you would consider a robot vacuum for your home, the Samsung Powerbot R7070 is easily the best option for a home with pets. This robot vacuum will run circles around traditional upright vacuums (literally). Sometimes, going with a non-traditional vacuum can be for the best. The combo of a robot vacuum and a handheld vacuum for upholster (learn more) can help keep your home cleaner than a traditional upright will. Once the Samsung Powerbot R7070 has cleaned your home for the first time, it'll store a virtual map of your floor plan. From here it can intelligently clean every corner of your home that you want it to. Just because this vacuum is small doesn't mean it isn't powerful. In fact, it is more powerful than the Bissel vacuum we just reviewed and did better on large debris, especially on hard surfaces. It had no issues with hair, flour, and large cereal. The maintenance on a robot vacuum is a little different than that of a traditional vacuum. The dust bin is smaller, so naturally you have to empty it more often. Apart from that, the brushes do not tangle and there aren't any cables or attachments you need to worry about, so maintenance on the Samsung Powerbot R7070 is almost non-existent. A lesser known brand name, the Miele Dynamic U1 Maverick is a high enough quality product to be known as a household name. The power to noise ratio on this vacuum will blow you away. When pitted against Dyson on carpet, the Meile outshined the higher priced machines time and time once again, and performed strongly when picking up pet hair. This vacuum has no problems picking up large and small debris ranging from cereal to hair and dirt and practically anything else. It is able to change between various heights of carpet effortlessly and does it all quietly and efficiently. With this model, all of the money you pay goes to the machine, not a bunch of accessories. There aren't a great deal of accessories you can purchase separately, however if you do not need them, this is a plus. The accessories that come included is a suction host and crevice tools that fit nicely onto the back of the maker. If you need serious power to help keep your home free of pet hair, this vacuum is one to strongly consider. Its cordless, so you need to remember to charge it. A somewhat fresh player in the game, Tineco is positioning themselves to be a Dyson alternative. A great deal of their products and offering points are comparable to Dyson products. The Tineco A10 is very similar to the Dyson V10 however at about 1/3 of the cost. This vacuum is a cordless stick vacuum, which means that you don't have to stress about being tethered to a cable, however you will have to be wary about the battery life. With 2 batteries, you can anticipate this vacuum to last almost an hour, which is ample time to vacuum most houses. If you are prepared to offer a somewhat new business a shot, Tineco appears to be very appealing right off the bat. 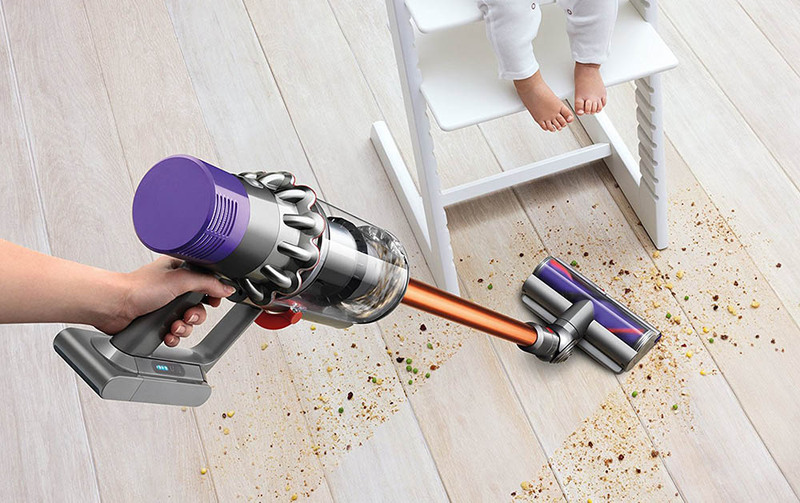 They are certainly matching Dyson's most well-known vacuum designs and undercutting them on price. This is an excellent option if you need the versatility that comes along with a cordless vacuum, but don't want to sacrifice power. Comes with an LED light on the front area to illuminate dark areas and is great for seeing hidden pet hair. This versatile vacuum is made by Shark. It is ultra-light which allows users to move it anywhere around the room extremely easily. The Shark Rocket TruePet Ultra-Light is conveniently fitted with LED lights that make it a lot easier to see in hard to reach places. If upholstery is an issue for you, the Shark Rocket TruePet Ultra-Light has an animal multi-tool which can help get pet hair off of rugs and upholstery which is a great function for family pet owners and homes with multiple pets that are allowed on furniture. This vacuum cleaner also has foam filters that are adjustable and quickly washable which is great if you're not looking to spend a heap on maintenance. This powerful, yet lightweight vacuum is an excellent choice for just about anybody, however is best if you value maneuverability and suction power. If pet hair does get clogged, the unit can overheat and shut itself off as a safety measure. It is a powerful and versatile vacuum that does a fantastic job on a variety of flooring types. This vacuum has a rubberized pet tool feature for removing stubborn animal hair from the flooring and upholstery. If you have multiple flooring types and need a vacuum that can switch quickly between them, this vacuum is a strong contender. With this vacuum, it is easy to empty dirt from the dust bin, and we didn't have any issues with pet hair getting stuck in there. It has a long power cable that can be rewound easily when cleaning. Its automatic functions standout and makes this appliance an excellent alternative if you're trying to find an intuitive product make cleaning simpler. This convenient 2 in 1 cordless vacuum from Puppyoo offers family pet owners lots of reach, while its washable HEPA filter and 4 stage purification system make sure that even the smallest particles get picked up and avoid of your carpets. Not only does it give a great deal of cleaning and suction power, but it also has a longer run time than lots of cordless vacuums: at least 35 minutes running normally and an outstanding 22 minutes on its high power mode. When you choose to stand it upright, the large rectangle brush lets you cover more surface area at once, without missing out on getting corners tidy. When used in the portable, more compact mode, you have 3 various brush accessories to make certain you're getting the most reliable use of your pet vacuum. If you hate running out of charge mid-clean you'll truly like this the battery life indicator light, which lets you know roughly how much more cleaning time you have left. When you start your journey looking for a good vacuum for a home with pets, you were probably overwhelmed with the options available. It is essential to take a step back and pay attention to what's important. You need to know what features to pay close attention to, and which ones aren't as important. The following are the most important things to consider when looking for a vacuum for pets. -Overall Power- This is obvious, but it should be reiterated. You need a vacuum that can get deep down hair and dander out of your carpets. Generally speaking, the more you pay for a vacuum, the more powerful it will be and the longer it will retain its suction. This factor isn't something to skimp on, especially if you have a home with pets. -Types of Flooring- The type of floors you have will determine what the best vacuum is for your home. If you have carpet, you have a lot more options and can afford to go with a more aggressively powerful vacuum. If you have hardwood or tile, you need to be a bit more careful. Hard surfaces can be easily scratched by a vacuums brushes, so make sure you opt for a model that can have the brushes turned off. -Performance With Hair- This is a big one if you have multiple pets, and especially so if those pets have long hair. If you have a dog or cat that sheds constantly, and their hair is long, you need a vacuum that has anti-tangle brushes. This is going to make maintaining your vacuum easier, and in the long run, it'll save you money. You also want to make sure the manufacturer has tested this vacuum and notates it is effective on pet hair. Hair and fur is different than dirt, so cleaning it up effectively sometimes requires a special type of vacuum. -Value- One thing that you'll probably notice about this article is that we didn't just pick the newest, most expensive vacuums on the market. This wasn't an accident. While newer models may have new technologies and do a great job, they often times come at a much higher cost than older models. Value is about getting the best vacuum for the money. All of the vacuums we mention in this post were selected because they are an excellent value at their respective price points. -Accessories- If you let your pets on the furniture, or have stairs, you will want a vacuum that comes bundled with handheld accessories to clean those areas. While this may sound like a given, not all vacuums come with the same amount of accessories. The reason why you can pay $60 for one vacuum but $600 for another probably has a lot to do with the extra tools included. When it comes to dog hair, you need to consider what breed of dog you have and how often they shed. Generally speaking, dog hair isn't as thick as cat hair, but there is more of it. Unless you have a husky or another winter-ready breed, you won't have to worry much about a thick undercoat. When selecting a vacuum for a household with dogs, you want a vacuum that has strong suction and can clean along the edges of the room well. You won't have to worry as much about a vacuum that can pick up larger debris such as cat litter. However, you'll probably want a vacuum that comes with a air powered or motorized attachment if you let your dogs on the bed or couches. For a home with cats, you need a vacuum that is a little more versatile than one you would have in a house with just dogs. Cats usually shed year-round, and their hair sticks to furniture and in your carpet more. When selecting a vacuum for a house with pets, you obviously want one with strong suction that can get the hair out of carpets and upholstery, but you also need one that can handle picking up cat litter as well. If you have hardwood floors, this can get tricky. Make you go with a vacuum that at the very least has attachments for upholstery. Ideally, you want a motorized head since cats tend to pick one favorite area and lay there all day, so the hair in that area can be incredibly difficult to get rid of. If none of these vacuums do it for you, check out our roundup post for the best vacuums of 2018 to see more options. Which vacuum do you think is best for a home with pets? Let us know in the comments section below! Think we missed something? We love to hear from our readers, so let us know what you think of the article down below.